Disclosure: This is a group event. I received nothing in exchange for posting this. "Mía Mariú is an innovative company that stands for beauty and health in harmony and above all, for happiness and balance for all women. With nature's finest forces, they offer a full line of health and beauty products designed to help you illuminate your beauty from the inside out. The Mía Mariú product philosophy is that beauty and health go hand in hand. Everything you want. All you need. Beauty and health in harmony. With Mía you don't have to spend a lot of money to get high quality botanical skin care, mineral cosmetics and nature's nutritionals that you want and deserve. That is what they are all about. Mía Mariú offers real health, beauty, balance and harmony for real women. Mía‘s natural health and beauty products are available exclusively through an Mía Mariú Independent Adviser or online here: http://miamariu.com/." I am always looking for new and exciting beauty products, and Mia Mariú definitely has that! I am envious of this winner, because that is a lot of exciting product for someone! Just imagine how many people you could cross off your list if you gifted this! Anyway, I hope you all have fun entering, and best of luck! 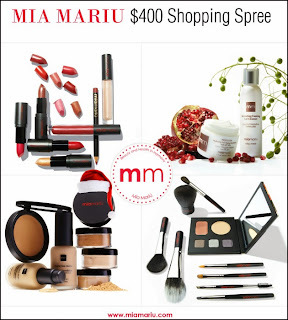 One lucky winner will get a $400 Mía Mariú Shopping Spree! Disclosure: Rats and More is not responsible for sponsor prize shipment. Please contact teri@mompoweredmedia.com with questions or to see your business or blog featured on the next big event!